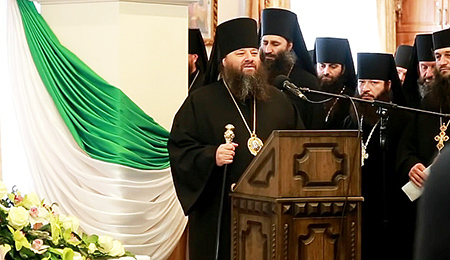 We, the Romanian Orthodox in Ukraine, have our hearts full of sorrow for all your priests, monks, nuns, and believers in Romania, confessing the True Faith, the true sons of our Orthodox Church, who are preserving the sanctity of all that you have received from the Fathers by the Seven Ecumenical Councils, the dogmas, Tradition, and loving much your Mother Church. You who want to remain steadfast in this ancestral faith, are today treated with such malice and persecution; you are expelled and removed from monasteries and churches! 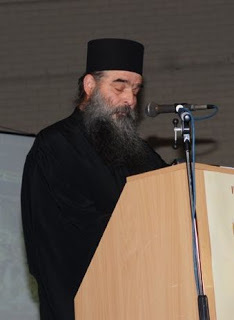 You suffer because you do not acknowledge the damnable heresies from the heretical Cretan Synod. So much so, that today, your own bishops and priests coming to you are worse than in the days of Communism. Blessed Bishops, you are not satisfied, shedding the blood of your Christians, or do you want to make them even more like Our Saviour Jesus Christ? We know quite well that all of you have signed the heretical documents in Crete, and all the madness with which when on at the Synod (of which we are ashamed to even speak), and went against the Truth of Our Lord Jesus Christ. But if you are sincere, then be open to the Christians! Accepting this predatory Synod, you gave up everything that had been hitherto most holy; you abused the teachings of the One, Holy Catholic and Apostolic Church, which Christ the Saviour has left us, and instead are honouring heretical ‘churches’. Many times I have asked myself: why this endless punishment on our Romanian people? why have we passed through so much suffering? Endured so much persecution and hard years in prison? After all, the blood of the confessors has still not dried on the prison walls. And now I understand that this is not a punishment, but a great blessing to those who want to purely follow the Saviour Christ; to be persecuted, hit, and hated even by their pastors, who have left the path towards Christ and took the curse of the ecumenist heresy. Beloved suffering soul that wants to go after the Lord Jesus Christ! I want to tell you that the time has come to manifest the Truth! Nothing can frighten you! 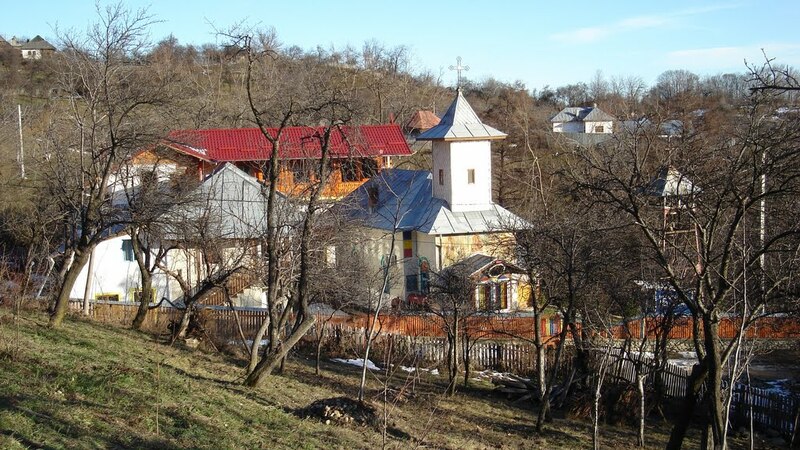 A place for Holy Liturgy you will find in the open-air, in houses, forests, caves, and catacombs; just stay confessors, and be persistent and steadfast on the right way of the Orthodox Faith! And you, ‘bishops’, who began mercilessly to beat on the children of God and His Blessed Mother; you have fun with the priests, monks, and nuns that you are expelling? Have you even lost the common sense of decency? Your Eminence, for what purpose did you come to serve in the Ukraine? To show the people that you are right and to profane here the flock of Christ with your heretical teachings? Perhaps you have forgotten the worlds of Metropolitan Onuphrius, which he asked you in the Monastery in Chrnivtsi: “Do you keep the Orthodox Faith pure?” But, Your Eminence, you do not allow others to follow the way of Christ and be saved. Stop the mad way of ecumenism! Discard the heretical synod of Crete! Embrace more the long-suffering people of Romania, who have not gone through an easy path in the course of history! My beloved Orthodox people, brothers and sisters in the Lord, keep the purity of Orthodoxy! I know that God will never leave you! I am a sinner and unworthy; I want to stay with you in this time of ordeal; I suffer with you, endure with you, cry with you; pray for one another. Because even if we were estranged, have suffered much without each other, though it was hard, but we are strengthened and united in the Holy Truth, because we have the same Faith, we have the same blood and the same nation. I want to serve all who are persecuted for Spirit and Truth, so please: Keep the Right Faith, even if you have to pay with the price of your life. Your Eminence, I write these words with pain from the heart, that I might let you know that the people here are suffering with the believers there. Please stop the persecution of those who love their Church, the Truth, and the Only Saving Faith, the Orthodox Faith. And for you, who took part in the false council of Crete, there is also a chance to go back from the ecumenist error by bringing forth to God repentance, so that we can all walk together to Holy Heaven. And if you call these children ‘fanatics’, ‘schismatics’, ‘rebellious’, how do you then call the four Churches who did not participate in the false Cretan Council, and the 33 bishops present at the Council, but, who did not sign and disagree with the decisions there? So why do you have so much zeal and piety to serve with those who were against it? Stop! For if you do not, God will stop you. Return to the Altar and Sacrifice pure, Orthodoxy, which Our Lord Jesus Christ left us. We ask your pardon if we have sinned against you. And for our Orthodox Christian people of Romania, pray to the Good God, the Glorified Trinity, Father, Son, and Holy Ghost, and to the Most Pure Theotokos, and all the heavenly powers, and to all the saints, that they give you the strength to remain firm and steadfast in our Holy Orthodox Faith; to manifest the truth unto the end! May the blessings and grace of Heaven strengthen you, and you should continue on pure path. Amen.